I’ve been enjoying using my spiralizer over the last few months, but so far i’ve only ever used it on courgettes (my one failed attempt on a carrot doesn’t count – too hard) to turn them into a far healthier option to spaghetti. I love making a stir fry, and so this option fits into my healthier lower-carb lifestyle. However, I’ve been curious of trying a Squash, and so on Friday I caved whilst shopping for some more pots at Twentypence Garden Centre, and I ended up buying a pack of Squash ‘Spaghetti Stripetti’ seeds (let’s not talk about the toasted tea cake smothered in butter and a big pot of tea, okay?). These can be sown now until mid-May indoors, or outdoors in late May.. so having picked up a mini propagator too, I had no excuse. 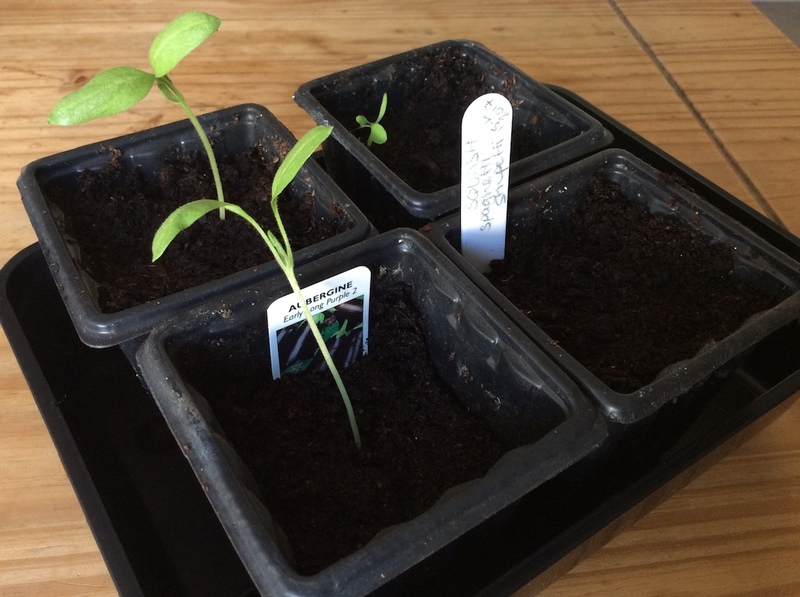 Filling a small pot with multi-purpose compost and adding just one seed (a second one might get sown yet), I sowed the seed on it’s edge – which is something the packet directed me to do. I’ve heard many other gardeners say this too for Squash and Courgette etc, in a bid to reduce the chances of these large flat seeds rotting. I then gave it a little watering, and it’s now in my mini propagator alongside the three Aubergine ‘Early Long Purple 2’ seedlings. One of those aubergine seedlings looks different though, and is curiously right in the corner of the pot. Has the seed not germinated, and a seed of something else made its home by chance? I guess we’ll find out in a few weeks. The Aubergine ‘Early Long Purple 2’ seedlings, with the freshly sown Squash ‘Spaghetti Stripetti’ pot, and the what-are-you? seeding. So, as I squeeze this pot into my propagator, I hope you are having a very happy long Spring weekend.